Earlier this week, I wrote a post on whether table and column aliasing affects query performance or not (http://beyondrelational.com/modules/2/blogs/77/Posts/14948/0168-sql-server-tablecolumn-aliasing-does-not-affect-query-performance.aspx) . We were able to determine that overall time-wise, both queries were performing equally well. However, one of the comments received as part of the feedback was to also include results of the following in addition to the use of simply the execution plan. I therefore repeated the tests after modifying the query a little bit to include the necessary SET statements and setting the buffer to a clean state. IMPORTANT NOTE: In this script, we use 2 DBCC commands – FREEPROCCACHE and DROPCLEANBUFFERS to simulate a cold buffer condition, which is generally achieved when SQL Server restarts. Doing so indiscriminately can have severe performance implications. Please do not execute the scripts shown in this example in your production or quality assurance environments. that is generally achieved when SQL Server restarts. Doing so indiscriminately can have severe performance implications. Please do not execute the scripts shown in this example in your production or quality assurance environments. Table ‘Employee’. Scan count 1, logical reads 9, physical reads 0, read-ahead reads 7, lob logical reads 0, lob physical reads 0, lob read-ahead reads 0. Table ‘EmployeeDepartmentHistory’. Scan count 1, logical reads 4, physical reads 1, read-ahead reads 0, lob logical reads 0, lob physical reads 0, lob read-ahead reads 0. Table ‘Shift’. Scan count 1, logical reads 2, physical reads 1, read-ahead reads 0, lob logical reads 0, lob physical reads 0, lob read-ahead reads 0. Table ‘Department’. Scan count 1, logical reads 2, physical reads 0, read-ahead reads 0, lob logical reads 0, lob physical reads 0, lob read-ahead reads 0. To compare the result sets, I simply used Excel. You can use any file comparison tool of your choice. What have been your observations related to aliasing? Do leave a note as you go. This entry was posted in #SQLServer, Blog, Imported from BeyondRelational and tagged #SQLServer on June 14, 2012 by nakulvachhrajani. Wow, that was a lot of work! I am impressed. If you’ll allow me, the only remaining thing would be to parse the two queries thousands of times (without running them, and with clearing the plan cache in between each one) and show total CPU consumption. This kind of test would truly definitively expose any possible difference in the cost of execution plan selection for aliases vs. no aliases. 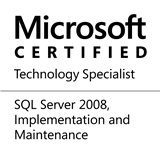 However, I have to say that any experienced SQL Server professional won’t need to see these statistics. An understanding of the phases of query execution plus actual query experience is certainly all that’s needed to prove that aliases require only a minuscule amount of resources. In all the the detailed work the engine has to do to parse and validate a query and choose an execution plan–something that happens quite quickly already–aliasing is one of the tiniest parts, accomplished without even any I/O on schema metadata! I agree, that for most who have been working with SQL Server as a profession, parsing queries thousands of times is not required because aliasing is just a tiny little part of the whole processing. In my humble opinion, aliases are nothing to be afraid of – if they make a query more readable, they should be used by all means. I would dearly love to see some scholarly research combining information on the formatting of code, the semiotics relating to it, concomitant comprehension and reading speed & clarity, and the brain architecture that explains why it is so important. Thank-you for your kind words, Madhivanan! @Erik: I agree. Often when I tell newer team members to format the code they write, use spaces instead of tabs, etc they look at me as if I spoke Martian. These things are elementary and fundamental.